26 weeks 'till St. George! My weekends have been less about training and more about spending time with friends... if you couldn't tell already but don't you guys worry.. this will all change once I get back from Australia mid December! Once I get back.. it's game on as far as training is concerned for my 2010 season! My week of interesting events started off with a text message from Coach that read, "How are you feeling and in general 26 weeks out from St. George?" I responded... "..... will be refreshed once back from vacation!" He responded, "Figure 3 weeks are gone for holidays, etc. Then 2 weeks for taper.. heck only 20 weeks!" I thought...wait! What?! This is not funny! But I responded with, "Your tapers are not 2 weeks, they're 10 days at best so I just gained half a week back :-)!" St, George is my first main objective for the 2010 season and it's safe to say that if I can do that Ironman, I can probably do any! The profile for that course is disgusting! I am quite fearful of that run but I think fear will be good for my training as I'll push harder knowing what I'll have to face! While coach is counting down my weeks to St. George, the only countdown I am concerned with right now if my countdown to my trip to Australia!! Speaking of which, if anyone has recommendation on where to stay in Melbourne, I am taking recommendations!! Had a great weekend... Saturday was beautiful here as I introduced Pip to the Golden Gate Bridge (so much better now that it's nearing Winter.. less tourists on rental bikes) and Paradise Loop! After ride, I stopped by Monique's Tag sale which raised over $5k to help relieve some financial pressures since her accident. I love it when the kindness of the human spirit shines through! After hanging out with Adam, Mo, Rick and Tyler for about 1.5 hours, I made my way over to Mill Valley to help Tricia & Sandy celebrate their birthdays! It was a full day but what a great day it was! Consumed too much sugar though! 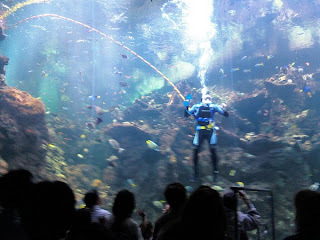 Sunday... hit the pool... hit the trails at Land's End... went with my friend Dana to watch Brian dive at the Aquarium in Golden Gate Park.. it was another great weekend spent! Photo below- Land's End..can you find a more beautiful trail?! 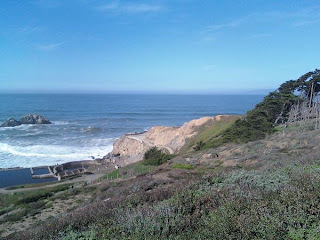 Well, maybe the Marin Headlands.. but I love the water! And btw, I am finally fully unpacked from my trip to Kona a month ago! See what happens when I get in a 12:30am and can't do it right away?! It sits for a month! !